BEIJING: Property prices in China’s major cities will fall later this year because of the government’s tightening campaign and a coming surge in housing supply, the country’s top listed developer said in comments published yesterday. The government will not end its clampdown on housing speculation even as the economy slows, and developers who try to resist lowering prices are being unrealistic, Wang Shi, chairman of Vanke, was quoted as saying by the Securities Daily. “Many developers who do not cut prices now are making a bet on policy,” said Wang, suggesting that they were hoping that Beijing would back down on its property controls. Wang said the issue was of social, not just economic, importance. “Property prices in some cities have risen to levels unacceptable to the middle class,” he said. Vanke and other big developers, including Evergrande and Greenland, have cut prices, boosting their sales. The value of properties sold by Vanke in July rose 65% from a year earlier to 8.44 billion yuan (US$1.25bil). Showing its determination to cool the real estate market, Beijing has instructed banks to stop extending mortgage loans to people buying third homes in at least four major cities, including Beijing and Shanghai. Malaysia's property sector showed signs of improvement with new launches increasing by 21 per cent in the first half of this year compared to the last six months of 2009. There was a 12 per cent improvement in performance this year and actual sales had increased marginally, according to a survey by the Real Estate and Housing Developers' Association (Rehda). The survey showed there was a 35 per cent increase in the number of new terraced houses in the market and a 7 per cent rise in semi-detached homes and bungalows. Rehda president Datuk Michael K.C. 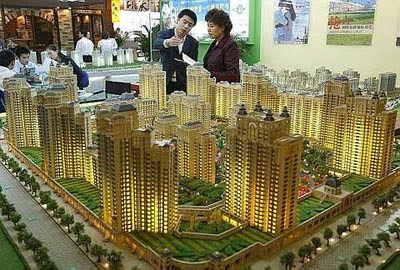 Yam said there was pent-up demand for high-end houses and expects the trend to continue in the second half of the year. The survey showed that majority of the buyers this year were first time owners and owner occupiers. Meanwhile, the top three most effective marketing tool, which helped push sales, were free/subsidised legal fee and stamp duty, and special financial packages. 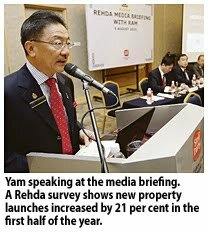 "Discounted pricing had dropped, indicating that the property market is moving upwards," Yam said a media briefing in Kuala Lumpur yesterday. Yam said developers are gearing to launch more houses in the second half of the year, in the all- price category. The survey involved 133 developers. Some 62 per cent of them were more optimistic of the market conditions against 43 per cent in the second half of last year. Prices of residential properties will rise 10-20 per cent over the next six months because of cost and inflationary pressures, says Real Estate and Housing Developers' Association Malaysia (Rehda) president Datuk Michael K.C. Yam. "The current housing market is simmering. There is no boom or bust, but property prices will rise. The increase will be in high-rise and landed properties in all price categories across Malaysia," Yam said at a half-year property market briefing in Kuala Lumpur yesterday. He said it was still a good time to buy property as the market was heading upwards, noting also the liquid banking sector and improvement in credit facilities for construction players. According to Yam, developers are planning more launches in the second half and each project will comprise more than 150 units. He also said that there was pent-up demand for semi-detached houses, bungalows and terraced houses priced more than RM800,000 each, especially in the Klang Valley and Penang. "There are a lot of upgraders who want to move from a terraced house to a semi-D or bungalow because of security and to live in a green environment." Yam said that key challenges for the sector would be higher interest rates, implementation of the Goods and Services Tax and removal of subsidies that would affect the lower-income group. "We need government support and accommodative policies to ensure the market is simmering. The government should also be more firm in their policies to attract foreigners to buy properties here." KUALA LUMPUR: The Real Estate and Housing Developers’ Association Malaysia (Rehda) is optimistic of the future prospects of the property market in Malaysia. Datuk Michael Yam: Majority of developers expect prices to rise. “For the first half of this year, the Rehda Property Industry survey for the first half 2010 showed that 62% of the developers were more optimistic of the market conditions compared with 43% for the second half of last year,” said Rehda president Datuk Michael KC Yam at a media briefing jointly held by Rehda and RAM Ratings Services Bhd yesterday. The survey showed that 58% of the respondents had launched new projects in the first half of this year, a significant increase compared with 31% in the previous half, Yam said. He said with the current favourable market conditions, the survey showed that 69% of the respondents would launch new products in the second half of this year. “The majority of the developers also anticipated prices to rise in the next six months. “About 41% said their properties will increase in value by less than 10%, while another 40% of the developers expect their property prices to increase from 10% to 20%,” he said. On the opportunities in the housing industry, Yam said the financial sector has been accommodative. “The banking sector is liquid, credit for construction players has improved and housing non-performing loans have declined,” he said. Yam said the regeneration of brownfield sites and the improvement in government policies had also been lauded for contributing to the favourable market conditions. He said although the business has gained momentum, the industry still faced challenges like the increase in the base lending rate, removal of subsidies and the high production cost. Yam said the current state of the housing industry was simmering and not boiling. “It is still business as usual, but it needs continuous government support and accommodative policies to ensure its stability,” he said. RAM Ratings chief economist, Dr Yeah Kim Leng, said the current monetary and financial conditions were conducive for sustainable growth. “Following a 10.1% gross domestic product growth in the first quarter of this year, and with second quarter growth estimated at 8.8%, Malaysia’s first-half GDP growth will likely hit 9.4% year-on-year,” Yeah said. The Rehda survey is conducted twice a year to assess the current housing industry conditions faced by its members. Property developer Bolton Bhd announced today that it has purchased 9.192 hectares (22.98 acres) of leasehold land in Ukay Perdana, Ampang, Selangor, for RM72 million. Executive chairman Datuk Mohamed Azman Yahya said the acquisition was in line with the company's strategy to expand its landbank with strategic acquisitions of prime parcels in the Klang Valley. "We intend to develop this site into a modern, thriving community and we are optimistic about the demand for high-end residential units here," the company said in a statement today. Bolton, through its sub-subsidiary Ketapang Realty Sdn Bhd, entered into a conditional sale and purchase agreement with LP Heights Sdn Bhd to acquire the land which comes with a development order for the development of 184 residential units comprising semi-detached and terraced houses, including town villas. Mohamed Azman said the company was planning to seek approval for layout amendment of the development order. He said the revised plan was expected to yield an estimated gross development value of about RM220 million. The project would begin upon obtaining all the approvals from the relevant authorities with an estimated development period of three years, he added. OCBC Bank (Malaysia) Bhd expects its mortgage portfolio to hit high double digits this year compared to 12 per cent last year, said a company executive. "During the first half, mortgages recorded a high double digit and we think this will continue for the rest of the year," head of Consumer Financial Services, Charles Sik told pressmen after the launch of OCBC Regular Premium Life Insurance Financing (LIF) facility in Kuala Lumpur yesterday. Home loan made up about RM10 billion of the bank's RM32.6 billion gross loans outstanding last year. The bank's gross loan outstanding increased by 5 per cent on the back of assets valued at RM53 billion as at December 2009. Sik said that OCBC mortgage lending holds a 5 per cent market share based on outstanding balance while on new business it commands up to 6 per cent. Last year, it recorded RM10 billion in home mortgages. "Basically, customers do not need to come out with any money upfront, whereas in usual practice the customers need to pay premium and take loan separately from the bank," he explained. With LIF, customers would be able to subscribe to the scheme and finance it through OCBC home loan mortgage. Meanwhile, Great Eastern director and chief executive officer Koh Yaw Hui said LIF will be available through its 17,000 agents nationwide. "With we are confident LIF will be both well distributed and well-received," Koh said. Great Eastern bancassurance partnership with OCBC since January to July this year has contributed 10 per cent or RM58 million to the insurer's new business mortgage-related insurance. "Our partnership with OCBC just started last year but we already saw 135 per cent growth in total new business premium during the period from January to July. "And there is room to grow. This year, we expect to see contribution of between 12 per cent and 15 per cent from OCBC," Koh added.